Fat burning foods are foods that burn more calories than their own calorie content, thereby helping in the metabolism of stored fat. These fat burning foods are natural foods, and when coupled with exercise, your metabolism can accelerate and you can burn more calories at a faster rate for several hours even after your workout. Vitamin C has always been the most famous antioxidant. Not only does it have benefits of fighting against colds, flu, cancer, and gallbladder stones, it also works to help you lose weight. According to studies, raising your daily intake of Vitamin C to 500 mg could boost your fat-burning potential during exercise by 39%. You can take vitamin C supplements in the form of tablets, but if you want to have the benefit of feeling full which will make you eat less, eat more citrus fruits. Fruits have fiber and cause your body to form bulk which contributes to fullness. Milk, particularly skim milk can boost weight loss by increasing fat breakdown in fat cells. It is famous for containing calcium a mineral that is needed for the maintenance of various body processes, including the production of strong bones. Getting enough calcium prevents the release of calcitriol, a hormone that causes us to store fat. Also, the carbohydrates in milk also cause your body to keep your insulin levels low thus preventing your body from storing fat. Protein needs more energy to digest than fat, therefore making you use those stored up energy even during digestion. Protein also has the power to stabilize blood sugar levels. Lean red meat helps you build more muscle because of its high protein content and low fat. The more muscle you have the more calories your body can burn. There’s nothing like a light, tasty and fun breakfast such as oatmeal — it fills you up but it doesn’t cause an insulin spike so your body doesn’t go crazy storing fat. Oatmeal is very low in fats while providing a great source of water-soluble fibers, which makes you feel full over a long period of time. Water-soluble fibers in oats also helps to lower your blood cholesterol levels. Not only do they contain antioxidants have benefits against cancer and have an over-all good effect on our body, these whole grain products contain fiber and complex carbohydrates which stabilizes the rising of your insulin levels so that your body won’t store more amounts of fats. Because fiber adds bulk to your meal, it contributes to your sense of fullness. Lentil and broccoli are examples of foods which are very high in fiber. Fiber takes a longer time for the body to break down. The digestible parts of these foods are released as glucose into the blood stream at a much more controlled and sustained rate, therefore you will have no problems with abrupt decrease in energy after exercising or after a very active day. The next time you see a chicken as your meal on your dining table, instead of grabbing for the leg first, take the breast part, then remove the skin. 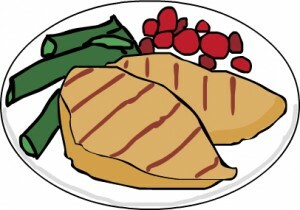 The breast part of chicken contains the most lean meat and the least saturated fat in the whole chicken. More lean meat means more protein and more protein means more muscle and less fat. Plain, low fat yoghurt contains calcium, which, we have learned awhile ago, helps in making you lose weight. Yoghurt is also a fun snack. So, instead of having those usual chips and fries as your snacks, think again. Yoghurt is a fun snack, packaged in different flavors. Not only this, yoghurt is a friend, and a companion in weight loss, not traitors like junk food. Leptin is a protein hormone which plays a key role in regulating appetite and metabolism. Salmon and tuna contain Omega 3 which helps lower your body’s leptin levels, helping your body burn calories faster. They also have a good amount of protein which helps you build more muscle. Fish oil has also been known to help in losing body fat. So the next time you plan on having meat in your meal, try white fish meat, in exchange for red meat. You can have a change in the taste of your meals, plus the benefits for your health. Egg whites are also lean protein with no fat in them. As we have learned earlier, protein helps a lot in making you lose weight. A word of caution with eggs, though. Make sure to eat in moderation especially the egg yolk. The yolk contains a large amount of cholesterol and eating too much of it will have bad effects to your body including cardiovascular diseases. For many people the best part is that you can essentially eat all you want and still lose weight, since most of the fat-burning foods are those that you can eat every day. Fat burning foods are not only for diet changes. They are also for lifestyle change. Keep in mind that these methods are still good with exercise and this requires discipline on your part in order to achieve the results that you desire.